Step 1 Place the roasted bell peppers, dried ancho chiles and sugar in a medium, heavy-bottom sauce pan. Simmer uncovered over low heat until the chiles are very soft and most of the liquid is evaporated, about 1 hour, 15 minutes. Stir in the balsamic vinegar, remove from heat and cool. Step 2 In a blender, or with a hand-held blender, puree the ancho-pepper mixture. (This makes 1 cup ancho-pepper puree, more than is needed for the chutney. It will keep in the refrigerator, covered, for up to 2 weeks.) Fold one-fourth cup of the puree (add more to taste) into the cranberry sauce. This makes more chutney than is needed for two sandwiches; keep covered in the refrigerator for up to 2 weeks. In Recipes-list.com we have selected the most viewed recipes from category - Leftovers Sandwiches . Enjoy the best recipes specially selected for you! 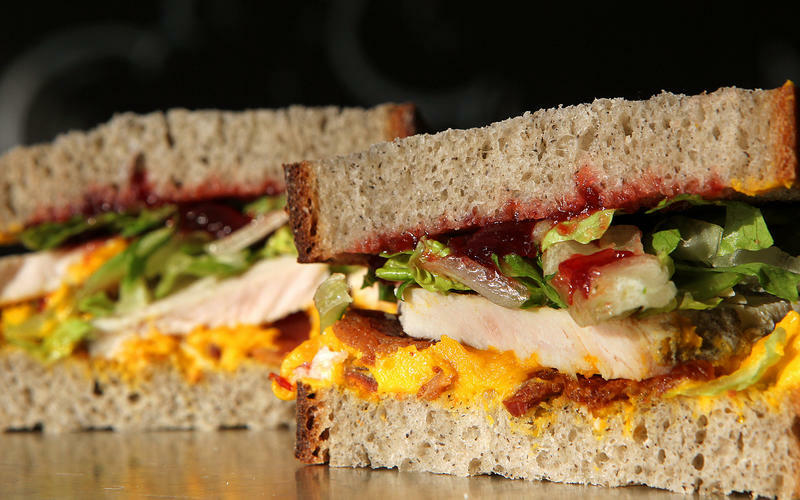 Carved turkey with kabocha spread and ancho-bell-pepper-cranberry chutney is the right choice that will satisfy all your claims.